Award winning local crime writer Sandi Wallace shares some insights on why she loves writing rural crime thrillers. There is a saying ‘Write the book you want to read’, and that’s what I do. I write rural crime thrillers. They are contemporary—of our time and reflect our culture and topical issues—and are mostly set in the Victorian countryside. Rural towns often have inbuilt tensions. While they can have a strong sense of community, the downsides can be lack of privacy, distrust of outsiders, closing in on their own or secrets. The influx of tourists or incomers complicates things for police and offsides the townsfolk. And these communities are vulnerable to natural disasters—flood, fire, drought and infestation—which brings out the best and the worst in people. All this gives both inspiration and backdrop for the themes and realistic crimes and investigations I draw in my books. Being true to people and place is important to me. Bad things can happen anywhere, although I never wish them on anyone. So as strange as it might sound, I set my novels in places I love. Twenty-odd years ago, my hubby and I first came across Daylesford and it has been one of our favourite places ever since. When I started my series, Daylesford felt like the natural place to set it. As a popular inland town, juggling tourists and a diverse community, bursting to the seams on weekends and in holiday periods and quiet midweek, it has great potential for simmering undercurrents…a dark side. I also showcase other places, although each novel has Daylesford connections. Mount Dandenong is my hometown with the best of both worlds: a beautiful country village in the hills, close enough to facilities and our family, and an easy base for escaping to other parts of country Victoria whenever we can. It’s an ideal location for the police-camp-gone-wrong story in my new rural crime thriller Into the Fog – stunning, but treacherous and difficult to search for the three missing Daylesford children in adverse weather conditions. Melbourne journalist Georgie Harvey, Daylesford cop John Franklin and several returning support characters are central to the story, with action back in the spa town when Franklin digs for local links. By writing rural crime, I combine into setting-rich Australian stories my favourite places, strong relatable male and female characters, and realistic crime scenarios. Writing crime fiction is a way to take on the world, its heartbreaks, disappointments, triumphs, virtues, exploring what matters, what moves me enough as a writer to spend many hours imagining, writing and developing a story over several drafts until it becomes a book. I’m thrilled to be returning for this year’s Words in Winter Festival. I hope the audience will get involved with questions, and there will be an opportunity for book signings towards the end. 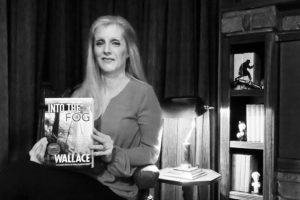 This year’s festival theme is chance and change, so I’ll share a bit about Into the Fog, which releases just two days earlier, and talk about chance, actions, reactions and consequences in contemporary crime fiction. Sandi Wallace is a guest at Words in Winter this year on Sunday 19 August at 12.00pm. To get in early and buy tickets go here, and to find out more information about Sandi’s books go here.